Ummmmmmmm so I need this. Like, will-do-anything-including-shovel-your-driveway-and-make-you-dinner-tonight-type of need. My friends Vanessa (shout-out girl) wore a cute Queen West toque a couple weeks ago and I immediately fell in love. I never see trendy pieces of clothing I’d actually wear that incorporate Toronto (especially when they look mega tourist-y), but these are just so darn cute. I came across them again today and have a serious urge to splurge. Produced by a company called Tuck Shop Trading Co., these toques ($35 each) are totes amaze-balls and represent your favourite Toronto hood. 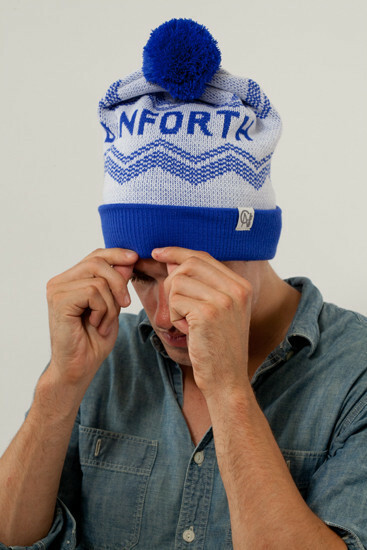 So, does the model come with the toque too? I also like/want this coat from the Tuck Shop as well. Just need to save up $445. Tagged with: fashion, queen west, toronto, Tuck Shop Trading Co.